Apple Photos vs Google Photos, What's Better? Nothing is more important to us than our precious digital photos, so keeping them stored safely in the cloud is crucial. The problem is, both Apple and Google have great photo-storage services, and it’s hard to know which one is actually better. Here’s how Apple Photos and Google Photos stack up against each other. For the purposes of this guide, we’re including the optional iCloud Photo Library as part of Apple Photos to make it a fair fight. While we can’t cover every small detail and difference between these two services, you should get a good idea of how they compare. Apple Photos comes baked into Apple’s own mobile and desktop operating systems, and it’s a little harder to access on other platforms. You can use Photos on iOS, Photos on macOS, and iCloud on the web to get at your pictures very easily, but there’s no Android app. iCloud for Windows gives some basic downloading and uploading functionality for those running Microsoft’s OS. Google Photos, like a lot of Google products, is made to be used with an internet connection. There’s a slick and comprehensive app available through any browser. Mobile apps for Android and iOS let you upload and access pictures on mobile, and there are also desktop tools for Windows and macOS. Google Photos can also integrate neatly with Google Drive, so you can use the Drive desktop clients instead. If you’re using Apple Photos, there’s no Android support and limited support on Windows. Google’s service is definitively easier to use across multiple platforms and has a better web app, but if you use Apple products like the iPhone and Macbook, then you’ll probably be happier using iCloud. Google Photos lets you back up an unlimited number of photos and videos, provided you’re prepared to put up with a little bit of resizing (images must be a maximum of 16 megapixels and videos top out at 1080p). If you want original, untouched uploads, then the app uses Google Drive. Everyone gets 15GB for free on Google Drive, and upgrade prices start at 100GB for $1.99 a month. There’s technically no ‘free tier’ on Apple Photos, but you can choose not to use iCloud Photo Library at all and keep your pictures only on your devices. We wouldn’t recommend that because if something happens to your phone, you’re screwed. iCloud storage will give you 5GB for free, but most people will fill up that space in a matter of months. By paying extra for iCloud, you can easily add more space. Pricing starts at $0.99 a month for 50GB. The iCloud and Google Drive pricing tiers are broadly comparable, with (for example) 1TB of cloud storage space costing you $9.99 a month. That is the limit for Apple users, though, whereas Google Drive goes all the way up to 30TB (a cool $299.99 a month). Google’s unlimited, free, and easy to use storage system is perfect for most casual users and even pro photographers. When it comes to pricing and storage, it’s an easy win for Google Photos. If you want to do more than just store your photos, the fact that Apple has a native app for macOS gives it a slight edge for advanced editing options. Google has some decent editing tools, but they can’t quite match Photos for macOS. On mobile, both Apple Photos and Google Photos offer some handy editing tools covering basic adjustments and filters (but remember Apple Photos is iOS-only). Apple Photos does have a few more powerful tweaks available. The options in Google Photos are identical across the web and mobile, but for anything serious on either service you’re going to have to fire up Photoshop or GIMP. Apple Photos has a more comprehensive set of editing tools available on mobile (if you stick to iOS) and desktop (if you stick to macOS). Add to that the fact that Apple’s apps can be enhanced with third-party extensions and it’s an easy win for Apple in the photo editing category. Log into either Google Photos or Apple Photos and you’ll see your pictures organized by date, with the newest images showing up first. Sticking pictures into albums manually is straightforward. For our money, navigating around Apple Photos is just a little more intuitive than its rival from Google, though your mileage may vary. On macOS it also lets you build smart albums (like smart playlists in iTunes) that filter photos automatically based on their metadata. How you choose to organize your photos is up to you, but both these apps do a clever job of creating automatic albums (places, times, even selfies). If you don’t want to go through the trouble of organizing everything manually, this is a great option. Google’s approach is a little simpler and slicker, but not by much. Both Google Photos and Apple Photos let you create shared albums that other people have access to (and can add pictures to). Right now the whole process is more straightforward in Google’s apps—possibly as a result of all the different iterations that Apple’s photo products have been through, and sharing is just better on Android in general which also gives it a slight edge. It’s more or less a draw in this category, with only minor differences between both apps. It will ultimately come down to which app you’re most familiar with and most comfortable using every day. Smart search is a feature Google has made much of in promoting its photo service and one which Apple is now trying to catch up to. You can search for animals, scenes, people, times and more, and everything works very accurately. 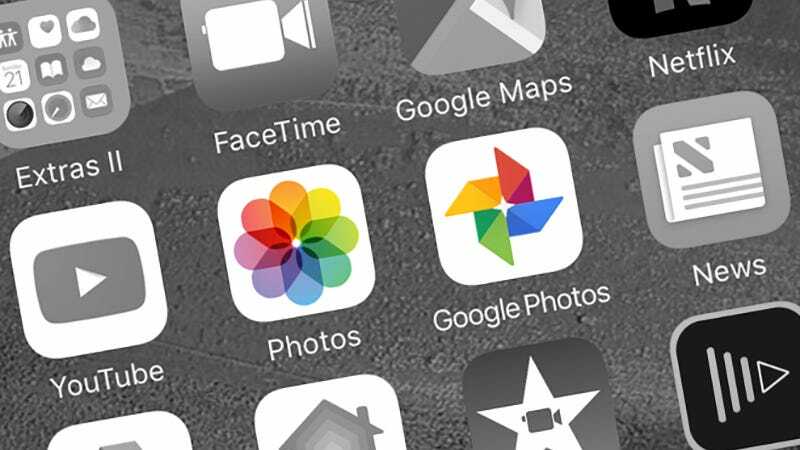 Apple is slowly inching its way up to the standards of Google, and new features including facial recognition are about to land in the Photos apps for iOS 10 and macOS Sierra. The updates also include tools to automatically create highlights reels for certain events, something Apple calls Memories and Google Photos calls Collections. While Apple Photos can find faces, places, and dates, it still doesn’t have quite the versatility or power in its searching options as Google Photos does, perhaps because it’s less focused on the cloud part of the service. Search options are pretty much non-existent in the Photos part of iCloud on the web too. If you want to organize your pictures manually, then either product will do, but Google makes that process easier by letting you use search as an organizational tool (as it does with Gmail). It’s also worth mentioning you can create collages and animations straight from the Google Photos interface. As always in Google and Apple comparisons, there are privacy considerations: all your data is stored on Google’s servers, whereas with Apple the extra smarts (like the places you’ve been) and searches are kept locked down on your local devices even if the 1s and 0s of the pictures themselves are stored in iCloud. From prices to editing tools, these two giant photo services are pretty much evenly matched in most key features. Yes there are differences, but very few stand-out ones. Both do a fine job of storing and organizing your pictures. The unlimited uploads option (with resizing) in Google Photos is likely to be appealing for most users who aren’t professional photographers. Google also wins in terms of cross-platform support if you want to access your pictures from anywhere. Its searching features are also the most intelligent and comprehensive right now. Apple Photos, as you might expect, is more convenient and more powerful than if you’re already using an iPhone. It’s also nice if you don’t need online functionality, or if you’re happy to spend money on the iCloud Photo Library. The changes coming to Apple Photos later this year suggest picture management is going to be another area where Apple will steal an idea from Google Photos, leaving the two products even more alike. Still, with Google’s constant investment in its cloud services and slight edges over Apple Photos in a few key areas—we’d suggest Google Photos for most people.